Recently Exide Gel batteries for UPS systems are getting popular. Gel batteries are different from normal flooded lead acid batteries. Normal flooded Lead acid batteries need distilled water topup atleast once in 3 months’ time. Many people do not have time to maintain their inverter battery which results in battery failure, cell damage and low back up problem. For such kind of busy people, Exide has introduced a truly “No Maintenance” battery. Yes, it doesn’t need any distilled water throughout its lifetime. Price Of Exide Gel batteries is on higher side compared to flooded lead acid batteries. Gel Batteries have some disadvantages too. Gel batteries have gelified electrolyte, which means a ‘gel-like’ mass formed by mixing sulfuric acid with fumed silica. This substance is static and standstill. #1. Gel batteries have very low rate of self-discharge which is better compared to normal lead acid batteries. #2. Gel batteries can be kept in any position, just like your briefcase (no restricted to upright position). You can fit the battery into any narrow space. #3. Gel batteries are literally “NO Maintenance Batteries“. NO need to top-up. Truly fit and forget type of battery. #4. The Gel used in the battery is fragile in nature and it breaks when the battery is abused with high amperage. 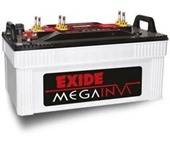 These batteries should be charged very carefully, unlike Classic Exide IT500 Flooded Lead acid battery, Exide Gel batteries are prone to damage if charged improperly. #7. 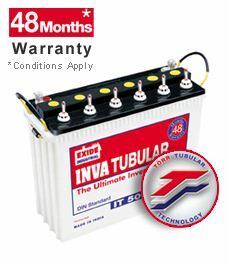 Exide IT500 Gel 150 Ah has 48 Month warranty which is very similar to Classic Exide IT500 150 Ah battery. No big difference in service life.